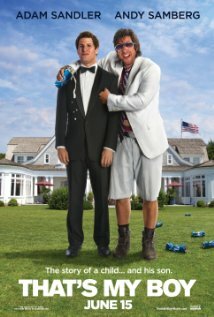 As someone who loved Adam Sandler and now loves Andy Samberg, That’s My Boy is a movie I couldn’t wait to see. What should be considered before the judgement: Sandler makes 3 kinds of movies: those we like a lot: like Billy Madison, Happy Gilmore and The Wedding Singer. Then there are the movies he makes for the studios: Spanlish, Click and Jack and Jill (studios think people are stupid and dumb, maybe they’re right.) Then there is the movie that we love: Punch Drunk Love. My Boyis a movie we’ll like. Comedies are always hard to predict, even after I see them (I did not like The Big Lebowski when I first saw it.) This much I can tell you, it’s good. I laughed numerous times. It’s up there with Billy and Happy and that says a lot. I’ve seen the comments and they are needlessly harsh. People need to relax. However, if you don’t enjoy Sandler to begin with and can’t accept his over the top character (took me about 10 full minutes of screen time,) then this will be a challenge. The meek and affable Samberg is warranted and necessary to soften this crass script and unruly storyline, but it’s the intense, vein bulging cliched Marine brother Chad that stole the show. Milo Ventimiglia is the performance that keeps on giving. If you were sick enough to watch The Divide then you may recognize Ventimiglia as one of the two utterly debased gay guys. He is HILarious! He’s military, he’s scary and he’s awesome! Don’t want to say anymore. I almost forgot to mention that Vanilla Ice plays himself and does all he can to ruin the entire movie. For me, the positives overshadowed the glaring negatives such as the terrible Vanilla and his atrocious flat bill style to the point that I came close to not including it here. People are hating this little comedy (4.6 on IMDB and only 22% on Rotten Tomatoes.) It is a hard R which aims too low, too often (nobody needs to see a girl lick questionable substances off a wedding dress in a comedy) and unless you’re my dad, you shouldn’t take your kid to it. However, it was as a kid that I fell in love with Sandler (his talking goat sketch still creeps into my daily lexicon) and more recently Samberg, who has usurped him. As I said, it was for these two teaming up that I was eagerly awaiting My Boy, but ultimately, as is so often the case, what I found and fell in love with was something totally different. Posted on Wednesday, June 20th, 2012 at 9:37 pm and is filed under Reviews. I couldn’t believe it when you said on the Film Vault that you liked this movie, but here’s the review. Billy Madison & Happy Gilmore are hilarious, his first comedy CD is tremendous & I quote the Goat skit ALL THE TIME as well. But your favorite part of the movie is not Sandler? He’s been box office garbage since the Waterboy. Also, perhaps it’s that I find “your boy” Andy Samberg to be negative funny. I still love you, Anderson.